There are plenty of great rewards-earning credit cards to choose from, but depending on where you live and which airlines best serve your hub airport, some of them are better choices than others. Below, TPG Senior Points & Miles Contributor Nick Ewen takes a look at the top options for travelers flying out of Dallas. There are many factors that can impact your decision on which travel rewards credit cards to open and carry in your wallet. Some may be attractive thanks to an increased sign-up bonus, while others allow you to earn extra points on different purchase categories. Where you live can also play an important role in this decision, and today I’ll continue my series that identifies the best cards for residents of certain cities. Previous entries covered New York, Atlanta, Chicago, Washington, Los Angeles, Seattle and Houston, and today I’ll stay in the Lone Star State and head up I-45 to Dallas. I’ll then detail out why that particular card would appeal to Dallas residents. Finally, I’ll note another one or two similar options any highlight the key difference(s) you’d notice. Before getting into the analysis, a few disclaimers. For starters, this list is aimed mainly at leisure travelers who are interested in maximizing their rewards on credit cards. If you regularly travel for business and earn elite status, the calculus may change significantly, as you have additional ways to earn points and miles, and some of the benefits I tout below may be included. Fierce loyalty to a single airline may also lead you away from cards offered by a competitor, though I would strongly encourage you to diversify in the event of a mass-scale devaluation (like we recently saw with American). In addition, this list represents just one way of looking at the situation and is geared mainly at free flights. You may simply want a card that offers solid everyday value for other rewards (like the Citi Double Cash Card for cash back or the Citi Hilton HHonors Reserve Card for free hotel stays). As always, feel free to adjust the list based on your own situation. Analysis: American calls Dallas-Fort Worth (DFW) International Airport its home base of operations, with nonstop flights to nearly 200 different airports around the world (some recent additions include service to Hong Kong and Shanghai). You can also find flights to Abu Dhabi on Etihad, London-Heathrow on British Airways, Sydney on Qantas and Tokyo on JAL. American is continuing to improve its offerings with the upcoming introduction of premium economy in November and the delivery of new aircraft like the Boeing 787-9 Dreamliner, though keep in mind that many premium-class redemptions were increased in March. In addition, the AAdvantage Platinum Mastercard will help improve your overall travel experience on American-operated flights (not to mention keep some cash in your wallet). You and four companions on the same reservation can check a bag for free on all AA flights, saving up to $50 per person on a round-trip domestic flight. You’ll also enjoy preferred boarding, and 25% off in-flight purchases. Finally, the card doesn’t charge any foreign transaction fees, so it’s a great option if you take any of the dozens of flights to Latin America offered out of DFW. 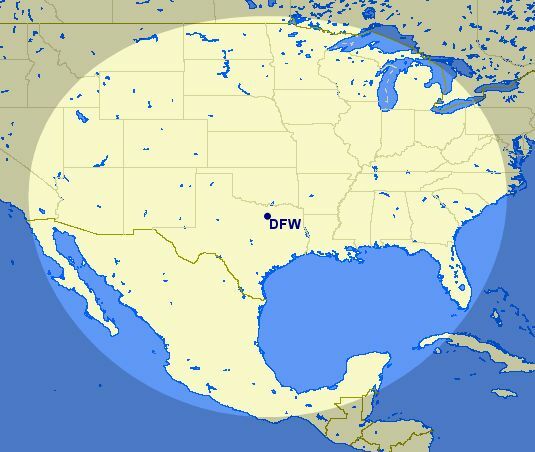 Dallas-Love Field (DAL) is much closer to downtown than DFW, and Southwest has a formidable presence there. Analysis: For those of you who don’t feel like hauling it out to DFW, another great airline option is Southwest thanks to its home base of Dallas-Love Field (DAL). Ever since the Wright Amendment expired back in 2014, Southwest has been able to operate flights to all 50 states (plus the District of Columbia), and the carrier currently offers nonstop service to over 50 destinations across the country, including Boston, New York-LaGuardia, Seattle and Los Angeles. The increased sign-up bonus on this card should get you around $750 worth of free flights, and the carrier’s no-fee change policy applies to award tickets as well. The card also provides you with 6,000 bonus points on your cardmember anniversary, which covers most of the $99 annual fee, and you won’t pay foreign transaction fees when traveling abroad. In addition, you’ll earn 1,500 Tier Qualifying Points (TQPs) for every $10,000 you spend on the card (up to 15,000 TQPs per year). Finally, and possibly most importantly, the points you earn on the card (including the sign-up bonus) will count toward the Companion Pass each year. This is one of the most lucrative perks in the frequent flyer world, allowing you to bring a companion along on all paid and award flights. If you can earn this pass living in Dallas (and the Southwest Premier Card is a great way to start), you can get a ton of value out of it! You also have a number of hotel transfer options with the Sapphire Preferred, like Marriott and (my personal favorite) Hyatt. While Ultimate Rewards points can also be redeemed directly for travel at a rate of 1.25 cents apiece, you’ll generally get much better value when transferring them to partner programs. The Sapphire Preferred card also offers some great value on everyday spending, with 2x points on dining and virtually all travel purchases. These categories are quite expansive, including merchants like Uber, toll agencies and bars that don’t even serve food. You’ll also pay no foreign transaction fees and enjoy primary car rental insurance. Both TPG and I use this card for a majority of our purchases, and we’ve both gotten some fantastic value out of the Ultimate Rewards program. Analysis: Another great option that provides flexibility and valuable redemption options is the Citi Prestige. The ThankYou Rewards program used to lag far behind its better-known brethren before it added several transfer partners back in 2014 (since expanded to include Air France, Qantas, Virgin Atlantic and Virgin America). These carriers offer many great redemption options, but you can also redeem your ThankYou points to pay for American flights (at a rate of 1.6 cents apiece) or for flights on any other airline (~1.33 cents apiece). This is a great way to decrease or eliminate out-of-pocket expenses if you hold the Prestige Card. The added perks on the card make it a long-term keeper for me, and if you live in Dallas, these can be especially valuable. For starters, you can access the Admirals Club when traveling on American, and you’re even allowed to bring in guests traveling on the same itinerary. However, unfortunately Citi just announced that this card will drop this benefit next year, so if the card’s other perks aren’t appealing to you, you might want to think twice before signing up and consider the Citi AAdvantage Executive World Elite Mastercard instead. With four locations to choose from in DFW (one each in Terminals A-D), you shouldn’t have any problem finding one near your gate until this benefit expires on July 23, 2017. If you do, remember that the Citi Prestige also comes with Priority Pass membership, so you can check out The Club at DFW in Terminal D as well. The $250 annual airfare credit will automatically post when you complete a qualifying transaction and effectively lowers the annual fee to just $200, and the card also includes up to a $100 credit for Global Entry, three free rounds of golf at certain courses each year (eight in the Dallas/Fort Worth area) and the amazing 4th Night Free benefit on paid hotel stays. The Amex Platinum grants access to Centurion Lounges, and DFW just happens to have a location. Analysis: A final credit card that you should consider as a Dallas resident is the Amex Platinum card. While this carries a $550 annual fee, the valuable perks can easily outweigh the cost. One of the best for Dallas-based travelers is the American Express Centurion Lounge access, as DFW is home to the second oldest Centurion Lounge, which opened back in 2013. The Lone Star State recently became the first with two locations thanks to the Houston (IAH) lounge that just opened in June. Other locations include Las Vegas McCarran (LAS), New York-LaGuardia (LGA), Miami (MIA), Seattle-Tacoma (SEA) and San Francisco (SFO). The card also provides access to Delta Sky Clubs when traveling on Delta (there’s one in Terminal E of DFW) as well as Priority Pass lounges, though you unfortunately can’t bring guests into either location. The points you earn on the card are also quite valuable, as you can transfer Membership Rewards points to one of 17 airline partners to then redeem your points, and many offer nonstop flights from one (or both) of the Dallas airports. Like the Citi Prestige, the Platinum Card comes with a $100 Global Entry credit, which hopefully would come in handy given the extensive international service offered out of DFW. In addition, it should be relatively easy to get the $200 fee credit each year. Many things can influence your decision on which credit cards to open and utilize on a regular basis, and if you’re interested in free flights, geography should play an important role in the decision-making process. As always, be sure to evaluate your own spending patterns and consider how you want to redeem your points and miles to choose the best card. Hopefully this post has highlighted some possible options if you currently live in Dallas! For the Dallas-based TPG readers out there, what’s your favorite credit card for award travel?